Is this game as good as the 3DS original? Let's find out! 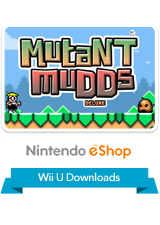 Early last year Renegade Kid released Mutant Mudds on the 3DS eshop and the game was met with a good deal of positive feedback, and now a Deluxe version of the game has been released on the Wii U with new stages and enemies! The game is decidedly retro and has very simplistic controls, however the game requires alot of concentration as one wrong move can cost you a life. The ability to move between the background and the foreground is a great feature that remains intact from the 3DS original and adds a new layer of fun to the game! The game features the original stages, the granny stages from the 3DS dlc, and 20 new stages exclusive to the Deluxe version of the game, bringing the total amount of levels up to 80! The graphics in the game are retro, but also have a sort of modern feel to them as the graphics are 2.5D. The enemies and stages are very unique looking and really showcase the developer's creativity. The music in the game is quite good, but could have been better, but the retro sound effects and title screen tune make up for this shortcoming! With great gameplay, simple controls, amazing graphics, and a fairly decent soundtrack we would recommend this game to any platforming fan! That's a great review man! A little short, but straight to the point. Sweet review, but why is it in the 3DS reviews? This shouldn't be in the 3DS reviews section lol.